Planning your ski holiday to Madesimo? Here you will find information about your ski trip such as piste facts, weather reports and information on ski resorts nearby. Here you will find 25 ski slopes and 11 ski lifts. The vertical drop is at most 1400 meters and the highest served area by the ski lift system is at 2995 meters. The longest piste is 5 kilometers. In case you get bored skiing Madesimo or just want to try something else, there are 10 kilometers of cross-country skiing tracks to try or just try one of the 8 restaurants. The closest airport is Lugano Airport located 59 kilometer from Madesimo. Ski resorts close to Madesimo are for example Savognin, Corvatsch and Lenzerheide. The ski slopes and the ski lifts in Madesimo are open right now and the snow depth in the pistes are at most 280 centimeters. 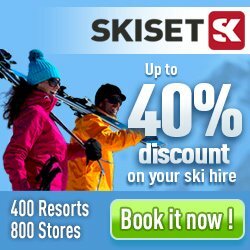 Via Skiset you can rent equipment online, both skis and snowboards. You can also save up to 50%. Here you will find in total 57 hotel, apartments and chalets/houses in Madesimo.